Slides from “Writing the Brain” PowerPoint. This is the sixty-second post in a series that I call, “Recovered Writing.” I am going through my personal archive of undergraduate and graduate school writing, recovering those essays I consider interesting but that I am unlikely to revise for traditional publication, and posting those essays as-is on my blog in the hope of engaging others with these ideas that played a formative role in my development as a scholar and teacher. Because this and the other essays in the Recovered Writing series are posted as-is and edited only for web-readability, I hope that readers will accept them for what they are–undergraduate and graduate school essays conveying varying degrees of argumentation, rigor, idea development, and research. Furthermore, I dislike the idea of these essays languishing in a digital tomb, so I offer them here to excite your curiosity and encourage your conversation. 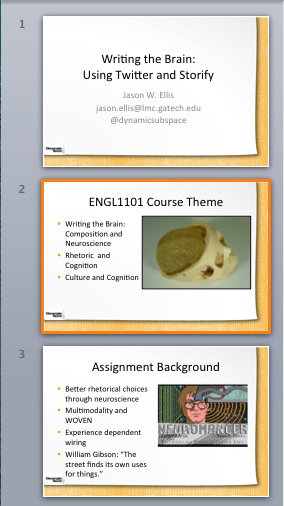 In this Recovered Writing post, I am including two PDF files that I used in my presentation on “Writing the Brain: Using Twitter and Storify” for the 2 October 2013 CETL Brown Bag Workshop. The first is my PowerPoint presentation file and the second is my handwritten presentation notes. Normally, I type up a carefully written script for my presentations, but in this case, I wrote my speaking notes out by hand. While I was driven my a tight deadline imposed by several other responsibilities converging at the same time, I saw this as an opportunity to experiment with a way of presenting that I normally don’t do and I wasn’t completely comfortable doing. As I tell my students, we grow by challenging ourselves, doing new things, and experimenting with new approaches. This was one such attempt on my part.